Everyone is different, but in at least one respect we are the same: we all like a good pen. Here at Promotion Pros, a good pen is exactly what we provide. Our pens for promotional purposes come in a variety of colors and styles, but best of all, they're made of high-quality materials that ensure they work well. The Sierra S stylus with twist action pen features a plastic barrel, chrome trim highlights and uses twist action to activate the stylus and the pen mode. 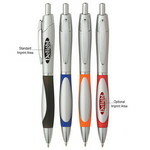 The Sierra Silver Pen is a sleek pen, with a silver barrel and colored grips; choose from blue, red, orange, or black rubber grip and a silver trim. It has a rubberized grip, making it easy to write with, and comfortable to hold. Our Sierra stylus with twist action ballpoint pen has a metallic colored barrel with silver trim and tip and a twist action mechanism. The Sierra Translucent Pen is a sleek pen, with a translucent blue, purple, green, red, orange, or charcoal barrel, with matching rubber grip and silver trim. It has a rubberized grip, making it easy to write with, and comfortable to hold. 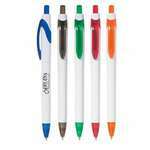 The Sierra White Pen is a sleek pen, with a white barrel and colored grips; choose from blue, purple, green, red, orange, or black rubber grip and a white accent. It has a rubberized grip, making it easy to write with, and comfortable to hold. The Simplicity Pen is a simple, yet attractive pen that has a rubberized grip, making it easy to write with, and comfortable to hold. It is available in white with blue, green, red, orange, or charcoal trim colors. 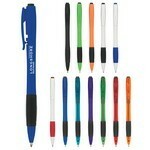 The Snap Pen is an attractive pen that has a retractable clip release. Snap it on pockets, and attract attention to your brand. 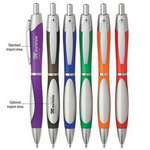 The Sonata pen features a sleek color design and comfort grip barrel for writing ease. The Sparrow Pen features textured rubber grip for the most comfortable writing expience, print your Corporate Logo for an amazing choice for Custom Giveaways. The Spartano Pen features ergonomic barrel shape with shimmering metallic finish to create impressive Promo Items. 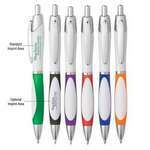 Our Swift click action pen has a colored barrel with runner grip and chrome trim and uses a click action mechanism. Our Sydney S colored barrel click pen features a silver barrel with colors in the clip and grip, along with chrome trim.